Did we mention that we have the @mention feature now? Yeah, that’s right. 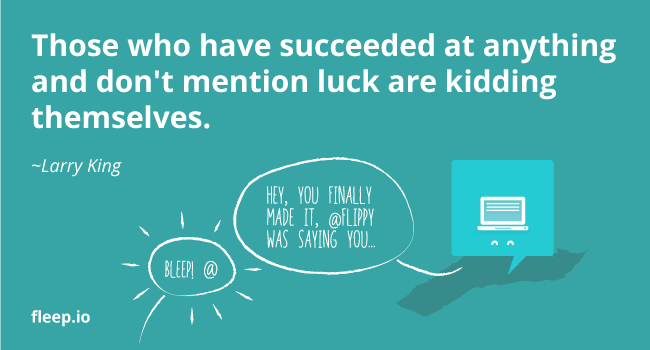 You can now @mention people in Fleep! First it was enabled in the web and desktop clients and now the mobile versions have caught up as well. So what are these @mentions that we’re roaring about? In a few words, they’re just an easier way to catch someone’s attention and to draw them back into conversation. What do I need to use @mentions? To mention someone in a conversation, you need to type @theirFleepusername in the message. Once you type @ and the first letter of someone’s name, a popup menu will appear – you can then select the person you wish to mention. If a name does not show up then this means that the member has not set up their Fleep username and cannot be notified with the mentions feature. How will the mentions look like to the other person? Mentions are visible in the flow and on the left pane. They appear as links, and clicking on the link opens the contact menu. 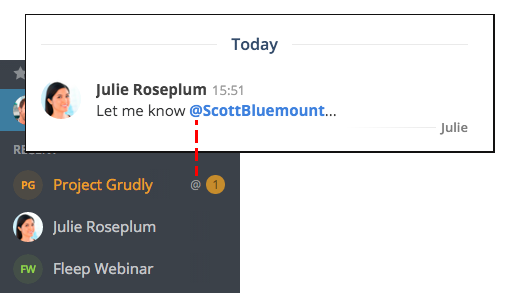 When you notify someone with an @mention in the conversation the other party will see new activity in the chat with an @-sign next to it on the left-pane and in the All Conversations list. Conversations where you’ve been mentioned have a higher priority and therefore are sorted above unread conversations in All Conversations list and on the left pane. Furthermore, when you hover over an @mention in a conversation, it shows the mentioned person’s Last Seen information. How can I mention someone who hasn’t set up their Fleep username? You can’t mention people, who don’t have a Fleep username or who are still email participants. The only thing you can do is to keep talking in the conversation until the other side responds. Hope that this short and sweet blogpost helped you understand the @mentions feature a little better. If you have any questions or concerns, then let us know and we’ll be happy to answer them in the Fleep Support or via our social channels (Twitter, Facebook).